So you’re confident doing ground tricks small spins, the odd rail and now you want to go bigger and get more air time. But first, hold on a minute –although snowboarding progression is about pushing your own limits, be careful not to attempt anything which is well out of your range. At the start of every winter, bones are broken and seasons ended early by kids who thought they’d try and emulate the pros by launching themselves off a monster sized kickers, and not quite making it. You must know your own limits. Start small and build up to bigger jumps slowly. Most ski resorts have terrain park features graded for beginners, intermediates and experts. Make sure you’re comfortable taking off and landing on moderate sized jumps before moving up to the bigger stuff. Before hitting any jump, it’s a good idea to first scope it out. Do a run through the park without hitting anything. Just watch and learn. Take note of the speed people are riding in at. Check out the condition of the jumps and the snow. Are they freshly shaped and soft, or are they gnarled and icy? Once you’ve got these basic facts, you’ll ready to give it a try yourself. But don’t just blindly shoot off a jump and hope for the best. You must first think about the trick you’re going to try. 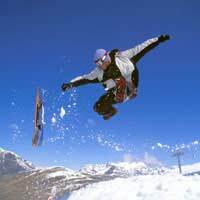 Professional snowboarders always visualise the trick they will attempt, and go through the movements in their mind first. It’s a mental game as much as a physical one. If you’re trying a jump for the first time, go for a simple trick like a straight air. If you land it ok, next try a grab. If that goes fine, move on to a spin such as a 180 or 360. So you’ve decided which jump to hit, but remember to follow slope etiquette. Don’t cut in to the queue – wait your turn. Always make sure the landing is clear, and that the previous snowboarder has ridden away safely before you start. On big jumps where you cannot see the landing, it’s best to use a friend as a “spotter”. They will ride down to check the landing is clear and give you the signal that it’s ok to proceed. As you start your run in, shout “dropping in!” to warn other snowboarders of your presence. Getting your speed right is a vital part of landing a jump safely. If you go too fast, you’ll overshoot the landing and come down on flat ground. This is a sure way to do yourself a serious injury, and many a snowboarder has blown out a knee this way. If you go too slowly, you’ll end up landing on the flat mid section of the jump, and again, risk damage to your legs. Watch other riders to see how fast they go, then follow their lead. So, you’ve hit the lip of the jump and you’re in the air. Try to stay stable and keep your arms still, rather than “rolling down the windows” a term that describes the flapping motion of a snowboarder's arms when airborne. Don’t forget to enjoy the floating sensation! Prepare for landing by looking at the ground, “spotting” the place where you’ll touch down and bending your knees to absorb the impact. If something’s gone wrong and you’re not going to land on your feet, try if possible to duck your head and bring your shoulders and arms up to your chest to take the impact, and try to roll when you hit the ground. Remember, start small, build up your skills slowly and be aware of your own limits. You don’t want to put an early end to your season on your first day.